The Amish and Mennonite women of Pennsylvania Dutch Country / Lancaster County, PA have been creating exquisite quilted masterpieces since the mid-1800’s (and some believe even earlier). Amish quilts are an expression of frugality. Listed below are local Lancaster-area shops where you can find quilting supplies and fabrics in Lancaster County, as well as information about quilts and quilting. Quilts not only serve a practical, functional purpose, but also serve as a form of entertainment. If you want to make your own quilt, you’ll have endless options of quilt materials to choose from, including traditional designs. 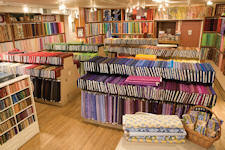 See also our listings for Lancaster County Quilt Shops and Online Quilt Shops.